This is a bank holiday weekend in the Republic of Ireland. Many years ago, the first Monday of June replaced ‘Whit Monday’ as a public holiday, but this year it also coincides with the Whit weekend at Pentecost. This afternoon [3 June 2017], four of us drove from Askeaton to Tarbert, caught the ferry across the Shannon estuary to Kilimer, and then drove through Kilrush along the Wild Atlantic Way as far as Kilkee, with its horseshoe bay, long sandy beach and cliff walks along the Atlantic coast. 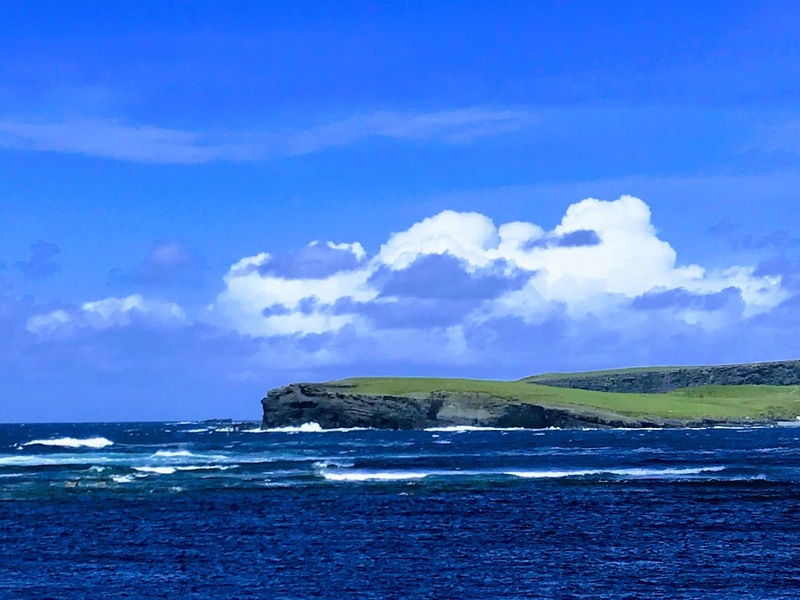 Kilkee was just a small fishing village until the 1820s, when a paddle steamer service from Limerick to Kilrush was launched, and Kilkee began to attract visitors. It soon became a resort was featured on the front page of the Illustrated London News as the premier bathing spot on these islands. Later, it became a popular holiday destination for people from Limerick, with steamboats travelling daily up and down the River Shannon. The fashion for wealthy Limerick merchants to find holiday homes by the sea brought a building boom in the 1830s, several hotels opened, and these, and three churches were built: a Roman Catholic (1831), a Church of Ireland church (1843) and a Methodist church (1900). In 1836, the Intrinsic, a ship from Liverpool bound for New Orleans, was blown into a bay near Bishop’s Island in Kilkee. The ship was dashed against the cliffs repeatedly and sank along with a crew of 14, none of whom survived. The Edmond, a passenger vessel sailing from Limerick to New York City, was driven by a storm into Kilkee Bay in 1850, split in two and sank at Edmond Point. Of the 216 people on board, 98 were drowned. Then, 50 later, in 1886, the Fulmar, a cargo vessel sailing from Troon in Scotland to Limerick, sank in Farrihy Bay, with the loss of 17 lives. In 1894, the Inishtrahull went missing near Kilkee coast. Despite these disasters, Kilkee went through another boom in the 1890s, when the West Clare Railway improved commercial life in the area. Many prominent people who came to visit Kilkee included the poet Sir Aubrey de Vere of Curraghchase near Askeaton, Charlotte Brontë, who spent her honeymoon here, Sir Henry Rider Haggard, Alfred Lord Tennyson and the Crown Princess Elisabeth (‘Sisi’) of Austria. The poet and songwriter Percy French was a regular performer in Kilkee and an incident on the West Clare Railway here prompted him to write his song Are Ye Right There Michael. During the ‘Celtic Tiger,’ the population of Kilkee could reach 25,000 in the summer months, although this has fallen significantly in the years since. An annual competition is the Bay Swim, a mile-long race from the east end of the town to the west across the bay. The Limerick-born actor, singer and songwriter Richard Harris was a regular visitor to Kilkee, and he won the Tivoli Cup in the Kilkee racquetball contest for four consecutive years, from 1948 to 1951. His statue by the cliffs was unveiled by actor Russell Crowe in 2006. 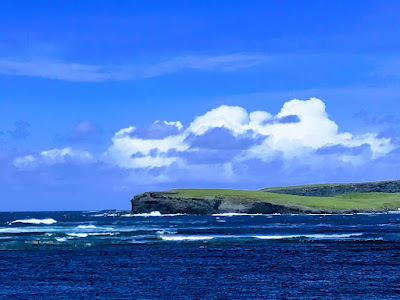 Beside the statue, the Diamonds Rock Café at the West End of Kilkee looks out across Kilkee bay and the cliffs surrounding the Atlantic Ocean. We had lunch there before returning to Kilrush, where we stropped at the Vandeleur Walled Gardens, before catching the ferry from Kilimer back to Tarbert. For many people in Limerick, the Redemptorist Church of Mount Saint Alphonsus is ‘Limerick’s spiritual home,’ and they have memories of the retreats and novenas, the ‘lighting of the 1,000 candles’ and the sound of the bells ringing across the city on special occasions. The Redemptorists were formed in Naples in 1732 by the Italian saint, Alphonsus Liguori, and received Papal approval from Pope Benedict XIV as the Congregation of the Most Holy Redeemer in 1749. The Redemptorists first arrived in Limerick in October 1851 to preach a mission in Saint John’s Cathedral at the suggestion of Edward Monsell of Tervoe, near Clarina, and at the invitation of Bishop John Ryan. These first Redemptorists included one Austrian, one Russian, two Belgians and a former Anglican priest, Father Edward Douglas. Two years later, the Redemptorists established a temporary presence in Bank Place, moved to another house at Henry Street, where they built a temporary chapel, and then moved to the present site – which they named Mount Saint Alphonsus – in 1854. The foundation stone of a new monastery was laid on the Feast of Saint Alphonsus, 2 August 1856, and the Church of Mount Saint Alphonsus was built in 1858-1862. An earlier proposal for a church in the Italianate style was designed by the Dublin architect Denis Butler. However, the church was designed instead by Philip Charles Hardwick (1822-1892), who belonged to the third generation of an important architectural dynasty. The Hardwick family first came to Co Limerick to work on the Dunraven estate in Adare, restoring Adare Manor, the Trinitarian Church, which is now the Roman Catholic parish church, and the Augustinian abbey church, which is now the Church of Ireland parish church. Philip Charles Hardwick’s work in Limerick includes Saint John’s Roman Catholic Cathedral and the Convent of Mercy. The Gothic Revival became popular in church architecture Limerick in the early 19th century, mainly through the work of James Pain, and its popularity increased with the Oxford Movement and the work of AWN Pugin, and some of the interesting figures in the story of Mount Saint Alphonsus were members of the Oxford Movement who became Roman Catholics. Father Edward Douglas had joined the Roman Catholic Church three years earlier than Cardinal Newman, and the lay supporters of the Redemptorists when they arrived in Limerick included Edwin Richard Wyndham-Quin, 4th Earl of Dunraven, Aubrey de Vere of Curragh Chase, and Edward Monsell, MP for Limerick and later Lord Emly, and one of the benefactors of Saint Mary’s Church in Rathkeale. The building work at Mount Saint Alphonsus was supervised by William Edward Corbett. The foundation stone was laid on 30 May 1858, and the church was dedicated to Saint Alphonsus on 7 December 1862. The church was built by Wallace at a cost of £17,000. Inside, the church measures 173 ft in length from the crown of the apse to the front door, and 36 ft in width. The high altar, designed by George Goldie (1828-1887), was the gift of a local merchant, John Quin, and was unveiled and dedicated on 15 October 1865. Goldie also designed the pulpit, and Goldie and Child designed the tower and spire, built in 1875 by Ryan & Co for £7,550, paid for by John Quin. This is a limestone church, with a gabled east-facing nave elevation and buttressing. The mission cross, located to the right of the door, was donated by the Drapers Assistants. The façade sculpture is by the Pearse family. The chapel of Our Lady of Perpetual Help, dating from 1868, was designed by Pugin’s son-in-law, George Coppinger Ashlin (1837-1921), who also carried out the interior decorative work in 1890. The crossing of the nave, transepts and choir is marked by full-height arch spanning the width of each side and rising from the square-plan limestone piers. There is an exposed hammer beam roof structure. The vast mosaic of Saint Alphonsus in glory was designed by Ashlin and Coleman and is the work of Oppenheimer of Manchester. The company was founded by Ludwig Oppenheimer, who was born into an Orthodox Jewish merchant family in Germany. He converted to Christianity and learned the art of mosaics in Venice. He established a mosaic business in Manchester and worked with many of the leading Gothic Revival church architects of the day, including George Ashlin and JJ McCarthy. The mosaic was put in place over the high altar in 1926 in preparation for the bicentenary of the foundation of the Redemptorists in 1932. There are chapels in both aisles with decorative mosaic and wall painting. The organ gallery has a timber parapet. The subjects of the stained-glass windows include Saint Brigid and Saint Margaret, The Visitation, Saint Alphonsus, and Saint Patrick and Saint Brigid converting the Irish.